So what was the purpose of the Wall? Was it a defensive barrier, a trade boundary or a control area to allow the Roman Army to keep a check on whom or what was going through the gates to the north or coming through to the south? Of course the Wall was almost certainly all three. First off, however, the prime purpose would have been to control movement through the Wall and not simply to stop it. To understand the purpose of why the Wall was built you have to understand what Rome was going through at that time. The Emperor Trajan, 96 - 117 AD, had fought several severe battles in the Far East and thereby stretched the Roman Army almost to its limits. Even so the Empire had reached its farthest boundaries at this time. Whilst on campaign Trajan became ill and sailed for Rome. During the Summer in Selinus, capital of Cilicia, Trajan had a stroke and died. Hadrian, his adopted son, became Emperor and withdrew all troops from Mesopotamia and Armenia and began to draw a boundary around the Empire. His ideal was not to expand the Empire any more than was necessary but to contain it and control it properly with proper boundaries. One of these boundaries was Hadrian’s Wall. Hadrian would undoubtedly have begun the process of conception and design of the Wall in Rome. But he did visit Britannia in 122 AD and would have seen for himself the area he chose to start the Wall build. Although the Wall nowadays begins at Segedunum, Wallsend, in the East it did not originally start there. The first fort on the Wall was Pons Aelius (Latin meaning: Aelian Bridge which is named after Hadrian’s family name), Newcastle upon Tyne, and extended West. Segedunum was an afterthought and added some three years later to afford a view from Pons Aelius to Arbeia (South Shields) on the East coast. This made perfect sense as Arbeia was a major supply base for the Wall and beyond to the North. As a trade boundary folk could be allowed through either way if the person was unarmed and paid a form of custom tax or fee. Farmers were granted movement so their livestock could be freely moved between fields etc north and south of the barrier. Because gates were regularly positioned along the Wall as there were no forts in its early days the population would have no more than half a mile to walk to get through one of them. Those who dared could climb over the Wall but it would be difficult, of course, for any animals to be lifted over and certainly no horses could jump it. With the even spacing of gates, and lots of them, this led to some curious bureaucratic decisions (probably by Hadrian himself) when turrets and milecastles were built between them. Some had sheer drops over the cliff edge when the north facing doors were opened. This is still evident today. The milecastles had, as already stated, north facing doorways and the Wall had a ditch near its northern face which has given rise to an archaeological mystery. To leave the south side of the Wall and go through one of the gates in order to get across the ditch there had to be some form of crossing but very little evidence exists of what actually crossed the ditch to allow movement north. Evidence of one causeway has been found at Milecastle 50 and partial evidence of a road at Milecastle 54 but none elsewhere thus creating the curiosity simply because of the number of gates through the Wall. There is the possibility, of course, that timber bridges would be built and evidence lost due to erosion or destruction of the same leaving no trace of a crossing. It is suggested that between twelve and thirty two men occupied each Milecastle but there is little solid evidence and over time, through thorough investigation and excavation at these points, more will information may be forthcoming. With so many men stationed at these positions there surely must be evidence, yet uncovered, that there was some form of crossing at least at several of the gateways. While there is no absolutely definitive answer as to the exact purpose of the Wall it is virtually a given that three main objectives stand out: a defensive barrier, a trade boundary and a citizen control area. 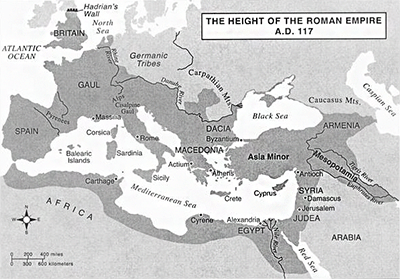 A fourth and maybe less obvious purpose is that the Wall gave the Roman Army in the region something to do. After all, a bored army with no purpose and no permanent enemy could mutiny. So it was always wise to keep the legions and units occupied. Once the Wall was built it had to be maintained and also administered in a proper manner. Also the Wall follows a line throughout the Empire that Hadrian drew up to show the limits of his boundaries for Rome and the occupied territories. This line (if you imagine it to continue east over the North Sea) continues into Eastern Europe and then through Asia and Africa etc. It is not often shown on maps as such but if you find a map from the time of Hadrian that shows the Wall in England then you should be able to roughly follow the Empire boundaries and it will be along those lines that the turf and timber, mud brick and stone walls would be built.